At the intersection of two of the main arteries of Madrid, C / Alcalá, and C / Arturo Soria, this square has become a transit area without identity and unwelcoming. The bus stop is oversized and the high amount of traffic generate environmental conditions not optimal for the pedestrian. 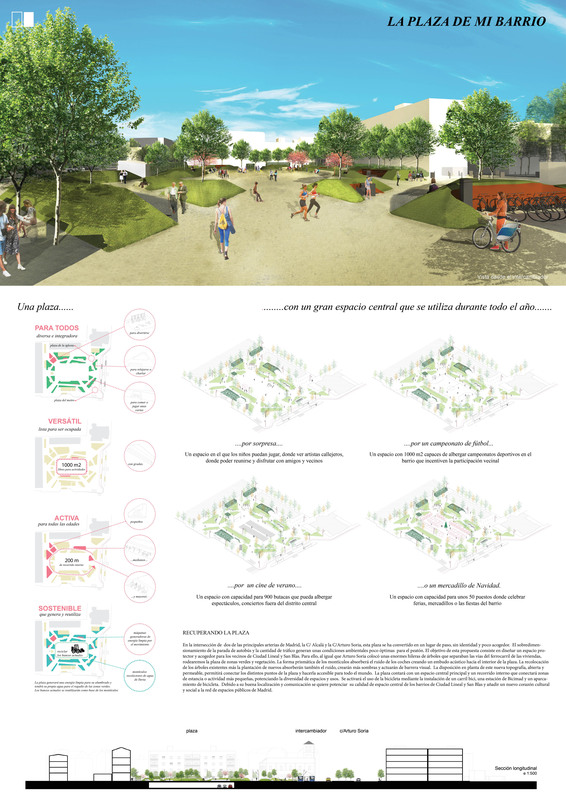 The objective of this proposal is to design a protective and welcoming space for the residents of Ciudad Lineal and San Blas. Taking inspiration from Arturo Soria, who placed enormous rows of trees that separated the railroad tracks from the houses, we will surround the square with green areas and vegetation. We create a new topography where the prismatic shape of the mounds will absorb the noise of the cars creating an acoustic funnel towards the interior of the square. And the relocation of the existing trees plus the planting of new ones will also absorb the noise, creating more shadows and acting as a visual barrier. The layout of this new topography, open and permeable, will connect the different points of the square and will make it accessible to everyone. It will also have a main central space able to accommodate markets and other events, and an internal route that will connect areas to stay, enhancing the diversity of spaces and uses. The use of the bicycle will be activated through the installation of a bike path, a Bicimad station, and a bicycle parking area. Due to its good location and communication, we want to enhance its quality as a central space in the Ciudad Lineal and San Blas neighborhoods, adding a new cultural and social heart to the network of public spaces of Madrid. 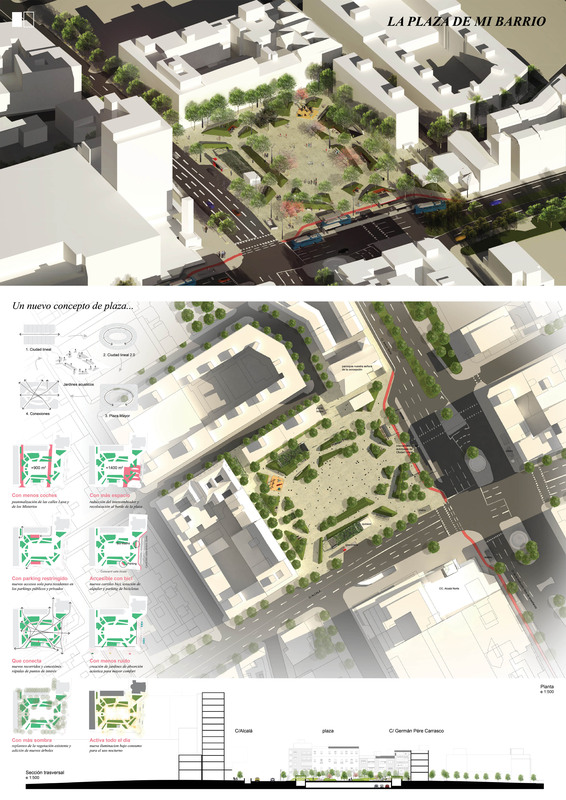 3rd Classified in the competition “Remodelación de 11 plazas de la periferia de Madrid” in October 2017.